Cash, good Ohio check and Major Credit Cards. 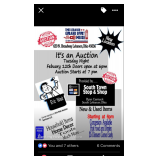 Public Auction February 12th! Ryan Carmack/South Town Stop & Shop! The Lebanon Grand Opry House, 620 N. Broadway Lebanon, Ohio 45036. New and used items! New items are warranteed by Mr.Ryan Carmack, used items are as is where is unless otherwise noted. Doors open at 6pm for the preview and the auction starts at 7pm! New househols items, home decore, tools and so much more!Concession Available Hot Food and Drinks $5 Dinners Come Early!!!! Eric Wait Auction Services LLC 937-205-9937 Auctioneers Eric Wait and apprentice Andrew Johnson. Come Join The Family Fun!! !